It is with pleasure and pride that I say a few words to mark the launch of the English edition of Zhu Rongji Meets the Press. We are honoured by the presence of Secretary Yu Zhengsheng. Mr Zhu Rongji has sent his greetings to Secretary Yu and Lord Patten. He also asked me to send his thanks to Lord Brittan, Mr Stephen Perry and other distinguished guests for attending this launch. I believe that our warmest congratulations should go to Oxford University Press and their Chinese partners for enabling this English version of Mr. Zhu’s book. 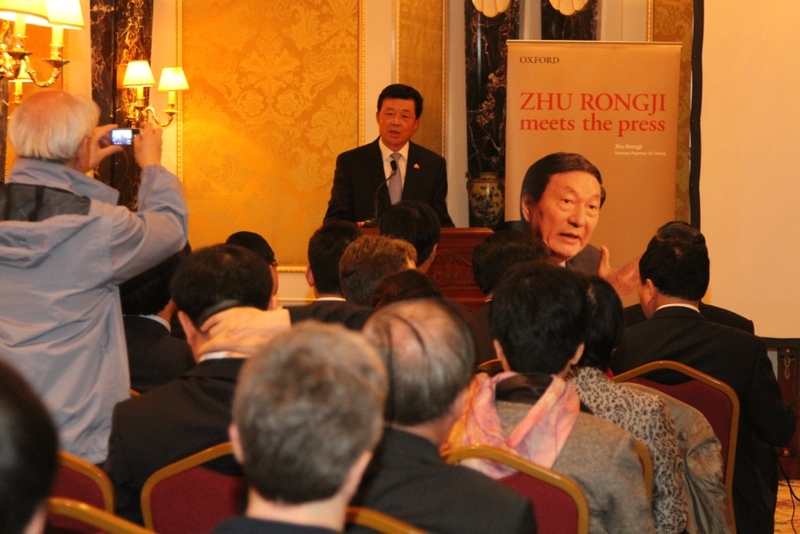 Zhu Rongji Meets the Press is a collection of Mr Zhu Rongji’s interviews with Chinese and foreign journalists. The book also includes his overseas speeches from 1991 to 2003 as Vice Premier, and then Premier of China. The Chinese edition, published in 2009, was an instant hit with readers. I very much hope the English edition will win similar popularity. I sincerely wish the book is popular as it is a powerful symbol of intelligent dialogue. This kind of exchange is a critical need between all people’s of the world to better grasp the development of China. Readers of the book worldwide will better understand Mr Zhu and China both in the past and for the future. For the past, this book provides much insight into the historical process of China’s reform and opening-up. The decade from 1991 to 2003 was a crucial phase marked by advancing reforms and opening up. It was a time of growing links between China and the world. A key milestone was China’s joining the WTO in 2001. That is just one example of advances China made between 1993 and 2003 that would be unimaginable without the outstanding contribution of Mr Zhu Rongji. His book is a window on China’s political, economic, cultural, social and foreign policy development in this decade. It adds up to a key contribution for anyone seeking a serious understanding of the recent past in China. Turning to the future, this book is a valuable guide to where China is going. How China has succeeded in becoming the leading exporter and second biggest economy is now a subject of growing interest in the West. People discuss and debate the future of China and what that means for the world. A study of Mr. Zhu’s book will greatly benefit such discourse. 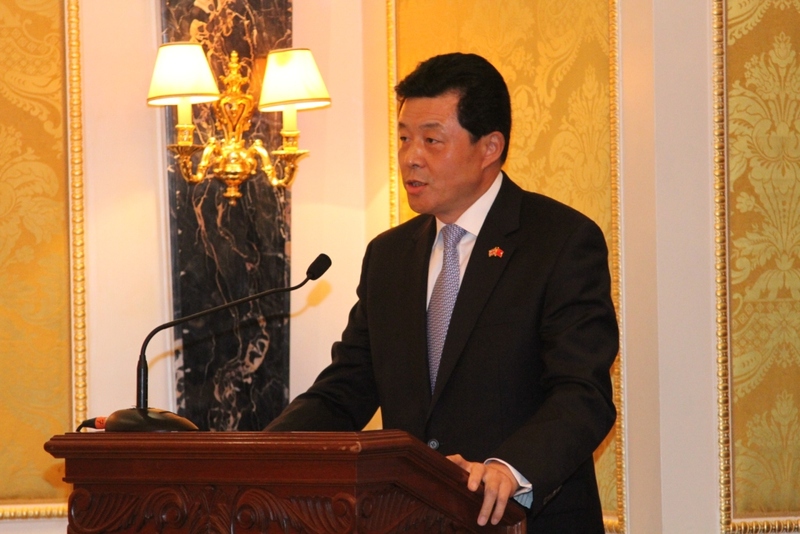 Mr Zhu Rongji is a key member of the third generation of leadership in China. His thoughts, insights and actions have had a major influence on how political and economic thinking have evolved in China. · Applying scientific thinking on development. · Adjusting our growth model. · And China’s path of peaceful development. 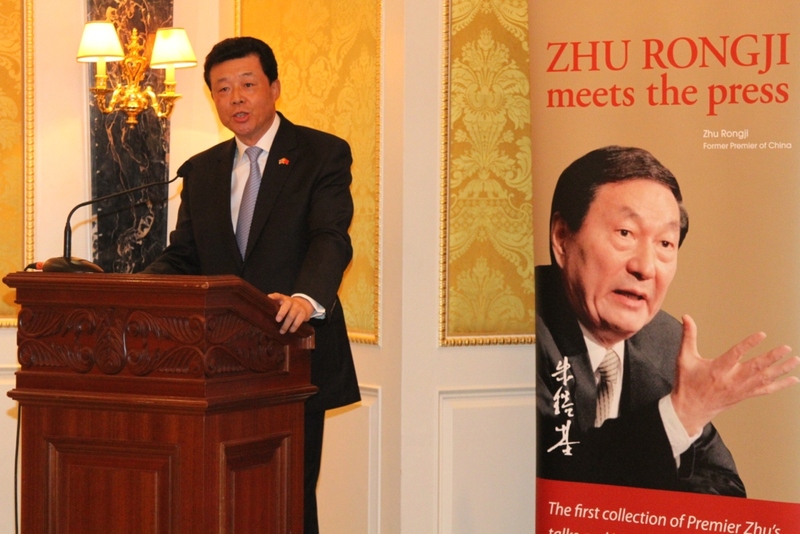 Overall the book reveals Mr Zhu as an outstanding political leader and a skillful diplomat. Readers will be reminded of Mr. Zhu’s endowment to China’s foreign policy and to peace and development of the world. His important contribution has been recognised by the many deep friendships that he enjoys worldwide. I had the honour to be associated with former Premier Zhu in his three overseas visits described in the book. This association provides me with insights into the strengths and character of Premier Zhu that I would like to share with you. The first was his visit to the United States in 1999. I was at that time Deputy Head of Mission of the Chinese Embassy in Washington. I had the honour of participating in the whole visit, especially listening to him speaking to the American public and giving interviews to journalists. He always spoke in a way that impresses, touches and inspires. The second was his visit to Egypt in 2002. I was then the Chinese Ambassador in Cairo. It was Premier Zhu’s second visit to Egypt after 8 years. I recall he used a famous Egyptian quotation: “Once you drink from the Nile, you will always come back.” This shows his knack of charming his hosts by reflecting a strong grasp of their culture. I am also deeply honoured that the book recorded that visit with a photo of my greeting Premier Zhu at Cairo International Airport. The third occasion was his first outbound visit as the Chinese Premier in 1998. It was to this country. Though I was not part of his delegation, Britain has connected us. It was during the visit that China and the UK issued a Joint Statement. This announced the establishment of a comprehensive partnership for the 21st century. This created a solid foundation for a healthy and stable China-UK relationship. Today, the comprehensive partnership has advanced to a comprehensive strategic partnership. This partnership features ever strengthening political and mutual trust; deepening win-win cooperation across the board and increasing understanding and friendship. As the Chinese Ambassador to the UK, I am fully aware of my deep responsibilities to uphold the hard-won good relations between our two countries. I am very ready to work with all communities of Britain to bring our relationship forward. Premier Zhu visited the Greenwich Observatory during his 1998 visit. He was asked about East-West relations and in response revealed his wit and insight. Premier Zhu Rongji is a leader who connects East and West and the launch of Zhu Rongji Meets the Press is another milestone in building understanding between East and West. I sincerely wish the book a very wide global readership! And wish the China-UK relationship continued progress and our two peoples ever-lasting friendship.